I’ve wanted to incorporate a more meaningful prayer time into our school day. I want my kids to voice their requests and take turns praying for each other. I’ve tried various methods for keeping track of requests but we often lose the slips of paper or completely forget about them. I needed a visual reminder to make prayer a priority. Therefore, we made a prayer wall. I try to make each child be as specific and detailed as possible to make each request more meaningful. Each day we choose one post-it note apiece and prayer over that request. We don’t add new requests every day, only when we feel led. And when a prayer is answered I plan to move that request to another part of our wall to be a wall of praise. Thankfully we have lots of wall space so we can move our requests around as we pray for them. It’s such a simple system that it is easy to implement. I’m hoping that this will keep us consistent. I have enjoyed having the visual reminder of colorful notes posted to our wall so that I don’t neglect our prayer time. 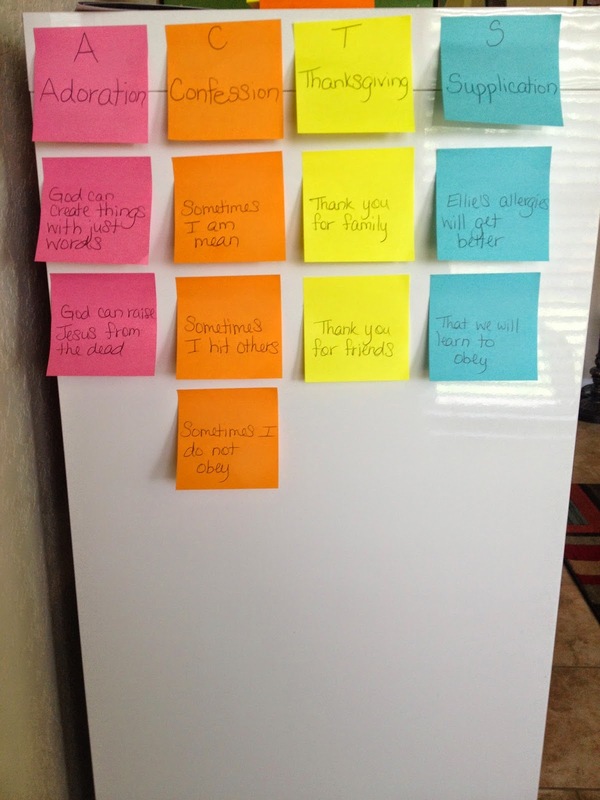 The kids absolutely love choosing one note to pray over each day. I’ve found that it keeps them from getting overwhelmed by a long list of requests, and their sweet insight and precious prayers minister to me.